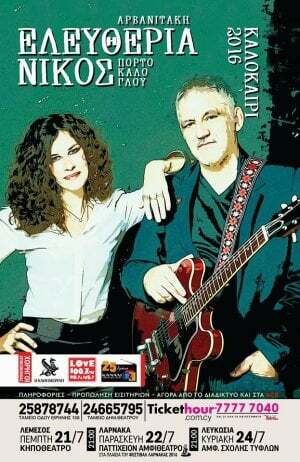 Eleftheria Arvanitaki and Nikos Portokaloglou continue their common appearances all over Greece and Cyprus during the summer in a show full of brightness, great emotional moments and spontaneity. The two artists combined their similarities and also their differences on stage, they exchanged songs and led their amazing band to musical routes of the East and the West and surprised each other – along with the audience – by performing songs that one could call “repressed musical desires”. For instance, Nikos asks Eleftheria “Should I stay or should I go” - the classic hit of the Clash – Eleftheria answers with “I'll break glasses”; and when Nikos declares “I will survive” - an adaptation of Gloria Gaynor's hit song – Eleftheria answers with the traditional song of her island Ikaria, where she originates from. Eleftheria and Nikos offer a live-party leaving behind smiling and shinny faces in the audience.